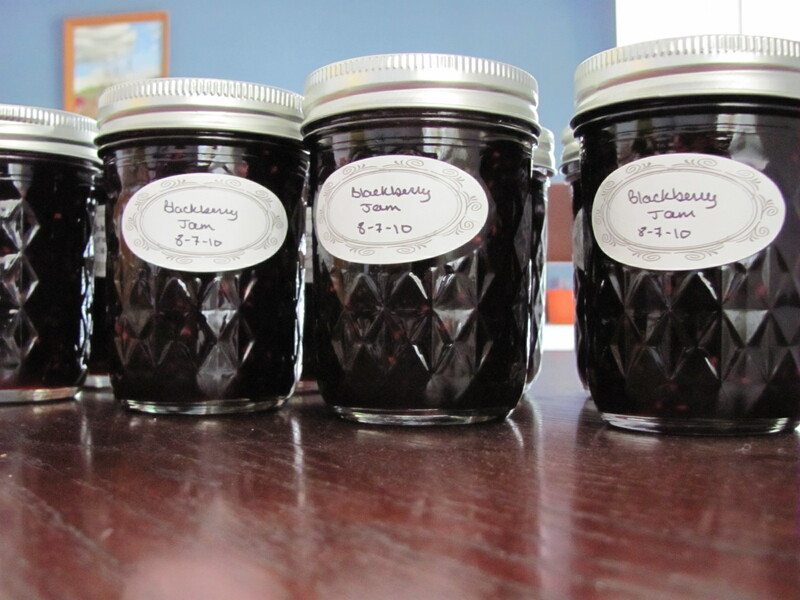 This summer I was inspired by my sister-in-law to try making jam. She’s been doing it for several years now, and loves it, and I thought, ‘Hmm… that could be kind of fun!’ I started with a Crock-Pot recipe for blueberry butter because it seemed pretty easy. Puree the blueberries, cook them down a little in the Crock-Pot, then add the sugar & spices and let it cook down a bit more, then ladle it into the jars, put the lids on, and stick them in boiling water for 10 minutes to seal them. I set out with intentions of finishing at a decent hour so I wouldn’t be up until midnight or later trying to finish canning everything, but I realized that my biggest pot was probably not big enough for more than 2-4 jars, nor did I have a trivet or anything that would fit on the bottom of my pot to rest the jars on. 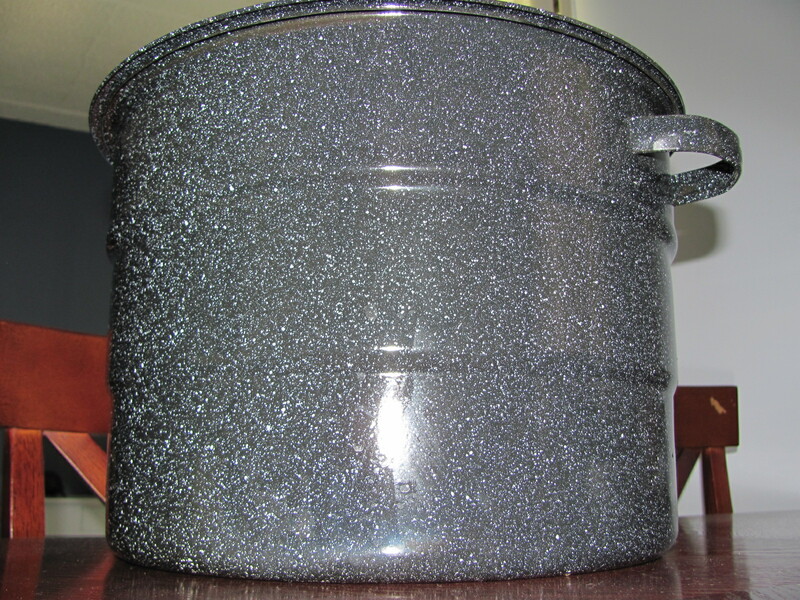 So I headed out to Walmart and picked up their last huge canning pot, complete with the rack to put the jars in. It’s big. And I have nowhere to put it, so it’s been sitting on my table for now, until I finally remember to take all those bags sitting in my closet to Goodwill. 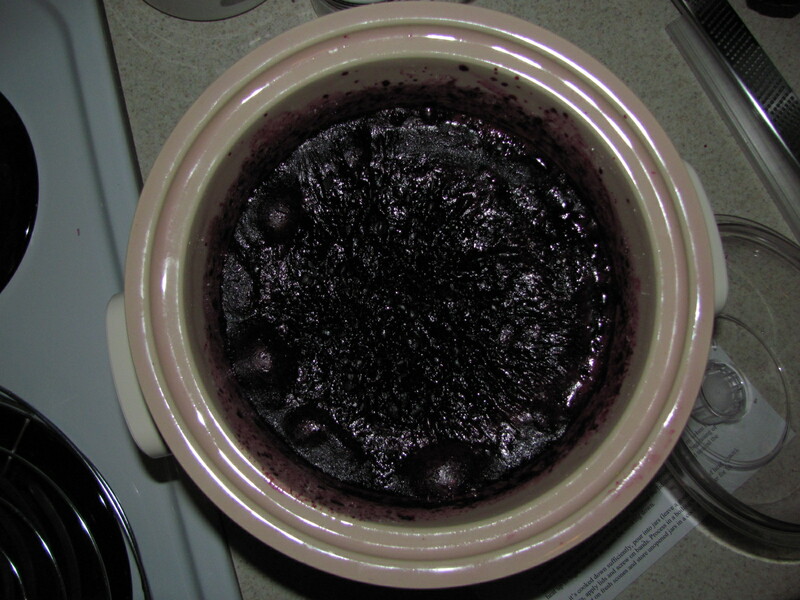 But at least I have it… I came home, pureed my blueberries, put ’em in the Crock-Pot and went and did something else for 4 hours or so, poured the sugar & spice in, then did something else for another hour-ish. I probably should have let it cook down a little bit more because I think it was probably a little more liquidy than it’s supposed to be, but for my first attempt at canning or making jam ever, I think it turned out just fine! After my initial attempt, I decided that I kind of enjoy making jam, so I decided that I was going to go peach picking at a local orchard with some friends and make peach jam. However, the weekend before I went peach-picking, my mom came to visit, and she had gone peach and blackberry picking with my sister-in-law before coming to see me, so I took some of her blackberries and made blackberry jam. The real way. Standing over the stove, stirring the jam… I was expecting to get splattered and have little mini-jam burns on my arms, but that didn’t happen. And it only took maybe an hour and a half total? And it’s wicked yummy. The recipe I used (the one in the pectin box) said I could de-seed half of the fruit pulp before cooking it down, so I did – it’s such a pain to pick all of those seeds out of your teeth! Yeah. Don’t ever tell a girl, or a group of girls, that you’ve got a ‘buy one, get one’ sale… especially when it’s fairly obvious they have no!! 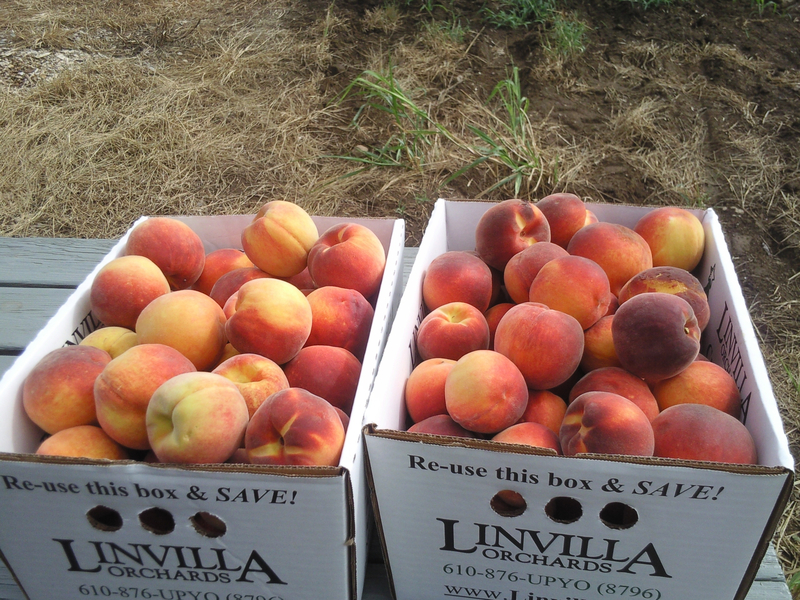 idea how many peaches will fit into a big half bushel box (I think that was the size). So we lugged all our peaches back to my place, and then spent the rest of the afternoon making jam, one batch at a time. I made the girls helping me boil (parboil?) the peaches before peeling them for the first two batches of jam, and then decided by the time we got to the third batch that waiting for the water to come to a boil took too long, and I was running out of ice for the water bath – so we just used a paring knife. 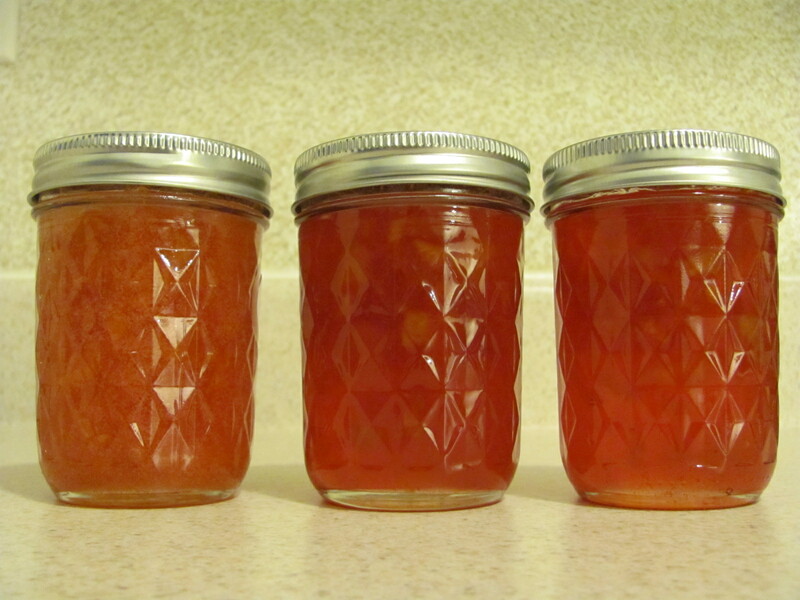 You lose a little more of the peach flesh, but I’m pretty sure it’s easier, so… At any rate, we made three different batches of peach jam (using the recipe in the pectin box), and I’m not entirely sure why, but the first batch looked different than the next two. It’s kind of bubbly – we decided that it must have been the absence of the 1/2 teaspoon or whatever of butter I didn’t put in. 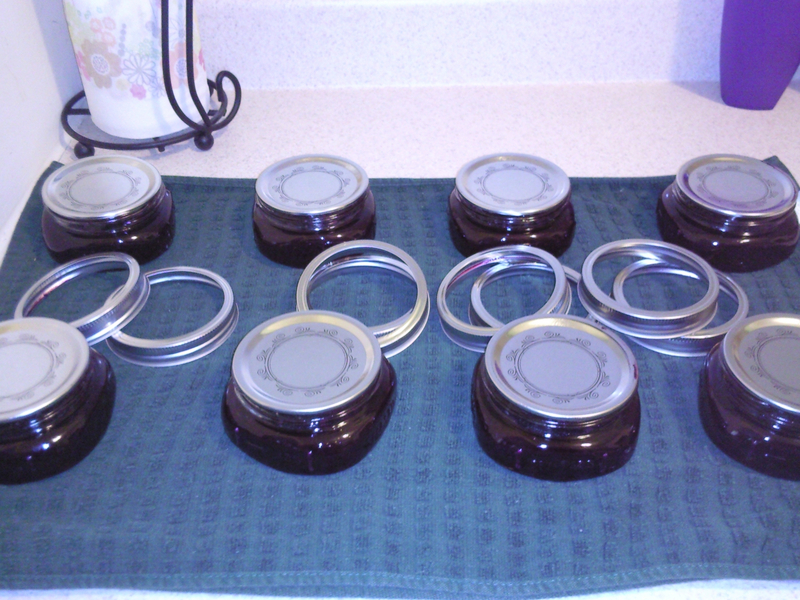 After making all that jam, I still had a ton! of peaches left over, so I sent a bunch home with the girls, made a couple of pies (both of which turned out watery… 😦 but now I know to add more flour to peach pie as well as apple), and still had lots of peaches sitting in my fridge. So I decided that since I had all these peaches, and I didn’t want all of them to end up sliced in my freezer, I’d try some peach butter. 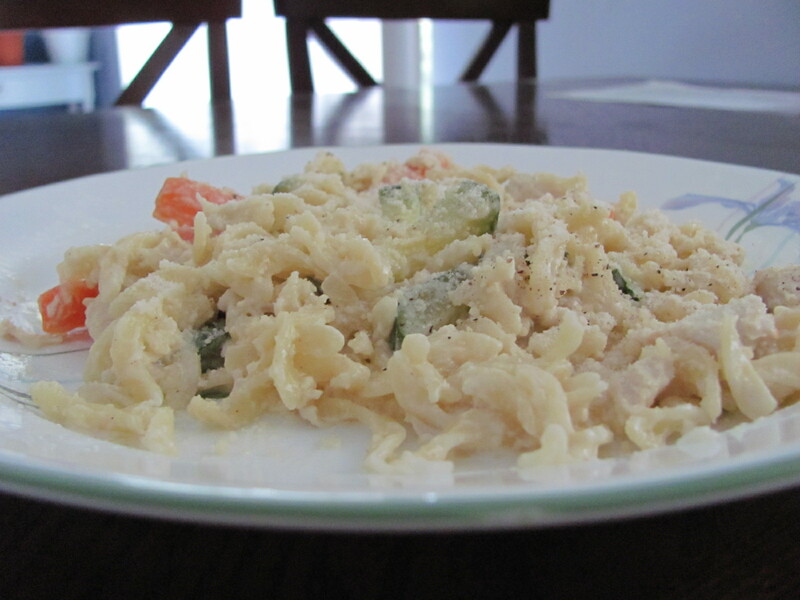 My sister-in-law had sent me an easy recipe (and a sample – yum!) so I just used that instead of hunting down one. I think next time I make a fruit butter (hopefully apple in another month or so!) I need to keep cooking it down until it definitely seems thick, because I’m pretty sure this butter also turned out a little more liquid-y than it’s supposed to be. It still tastes good, but yeah… it needs to be thicker. Oh well! There’s always next year… maybe I’ll limit myself to one box of peaches though. We started with the easiest recipe – Chicken in raspberry sauce. All we had to do was mix stuff together, put the chicken pieces in a freezer bag, throw the sauce in the bags with the chicken, and freeze it! Combine preserves, juice concentrate, soy sauce, vinegar, chili powder, curry powder, garlic powder, and mashed raspberries. Place raspberry mixture together with chicken breasts in freezer bag and seal bag securely. Freeze. To cook: Thaw chicken mixture completely and place sauce and chicken in large baking dish. Bake covered at 350 degrees for 30-40 minutes. Remove from oven, transfer chicken to serving platter, and top with pan juices. Garnish with fresh raspberries. A note on this recipe: We couldn’t fine pineapple juice concentrate (and we looked in multiple stores!) so I decided it would be just fine to substitute a can of Goya pineapple juice, since it was all part of the sauce anyway. If anyone in this general area knows where to find pineapple juice concentrate, please let me know! 🙂 Also, since the purpose of this cooking day (and the cookbook) was to have dinners in our freezers, I’m including the freezing instructions from the book, but you can always just skip that step and cook stuff right away. Oh, and the soy sauce makes the chicken look a little grey, but it’s still really good. Just FYI. Flatten chicken breasts to 1/8-inch thickness. In food processor or blender, combine basil, cheese, and garlic. Mix until a thick paste is formed. Add butter and blend. On a piece of waxed paper or plastic wrap, shape into a 3-inch square. Chill until firm. (To quicken chill, place in freezer for 10-20 minutes.) Slice chilled square of pesto butter into 6 sticks, approximately 1/2 inch wide and 3 inches long. Lay out a flattened chicken breast. Place a stick of pesto butter on the larger side of the meat. Fold the remaining side over the butter, then fold under the two ends. Press meat together on all sides to securely enclose butter. Using 3 separate plates, place seasoned flour in one, beaten egg in another, and bread crumbs in the third. Dredge rolled chicken breast in flour and shake off excess. Dip into egg, then roll in bread crumbs. Firmly pat bread crumbs onto chicken. Refrigerate chicken rolls for at least 1 hour to allow crumbs to adhere. Wrap each piece of chicken in plastic wrap, place in freezer bags, then freeze. To cook: Unwrap chicken rolls and thaw completely in refrigerator. Preheat oven to 350 degrees. In a large pan, melt 2 Tbsp. of butter together with 2 Tbsp. of olive oil. Sauté chicken for 10-15 minutes, turning chicken until golden brown on all sides. Place in lightly greased baking dish and bake for 40-45 minutes, until meat is white all the way through. I don’t know why Colorado… but it’s wicked good, so I’ll go with it. Brown meat and diced onion in skillet on medium heat. While meat is browning, prepare sauce (below). Drain meat and return to pan; add dry taco seasoning, salt, pepper, green chiles, green chile salsa, and 1/4-1/3 cup water. Mix well, cover; and simmer on very low heat for 15 minutes. Check meat mixture to see if most of the water has been absorbed. The meat should remain moist. Adjust seasonings at this point (if desired). Cover and keep warm. For sauce: In medium bowl, combine red and green enchilada sauces, sour cream, and cream or milk. Whisk together until well blended and smooth. (More sour cream or milk may be added if you prefer a less intense sauce). In a smaller pan, add 3-4 Tbsp. oil and heat over medium heat until hot. Using metal tongs, work quickly and dip each side of a corn tortilla in hot oil (not more than 1-2 seconds per side). Promptly place tortilla on plate lined with paper towels to drain excess oil. Repeat with remaining corn tortillas, adding extra oil to pan as needed. Note: We didn’t do this because we were trying to be healthier, but I think the crispy tortillas would have been good because they got a little too mushy. To assemble: In 9×13 baking dish, pour 3/4 cup of sauce on bottom of dish to cover. Place a single layer of corn tortillas on sauce. Top with a layer of half the meat mixture, then sprinkle with cheese. Repeat tortilla, meat, and cheese layers. Pour remaining sauce over layers and top with cheese. Bake at 350 degrees for 18-20 minutes or until cheese is bubbly and heated through. If you want to freeze this for later, line the pan with foil, then plastic wrap, follow the assembly instructions, cover as tightly as you can with the plastic wrap & foil, and then put it in your freezer. When it’s frozen, you can pull the wrapped casserole out of the dish, keep the casserole in the freezer, and have the dish free for something else! When you want to eat the casserole, pull it out of the freezer, unwrap it, and put it in the dish. Let it thaw completely, then follow the cooking instructions. This casserole is also really yummy.